We are the kind of people, “old school” some would say, who like to communicate with people – preferably in person, but we’ll take the telephone as a very adequate second and have learned to accept email as almost the equivalent – which sort of means that we like to see your face when communicating. But times are a changing and that’s okay too. We embrace it, really. And in time we shall adapt and accept you ordering on line but for now indulge us in this antiquated way of telephoning or emailing. P.S. 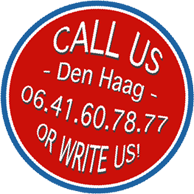 : Delivery here in Den Haag is free with orders of € 150 or more. Outside our hometown we charge a delivery fee which is dependent on several factors such as distance and size of your order. Let’s talk and together we’ll be able to figure out what is the best option for you!